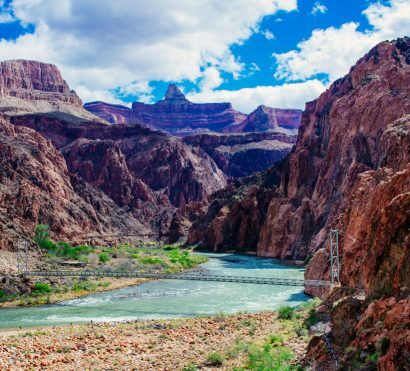 This exciting Grand Canyon backpacking trip descends into the canyon from the South Rim and winds down the famous Bright Angel Trail to the ages-old campground at Indian Gardens. Before settlers came west and ventured into the canyon, Bright Angel Trail was used for centuries by native tribes and was improved by prospectors in the late 19th century and tourists were charged for its use. In 1928, the park service established itself as the overseeing body of Grand Canyon National Park and began maintaining the trail for the public. 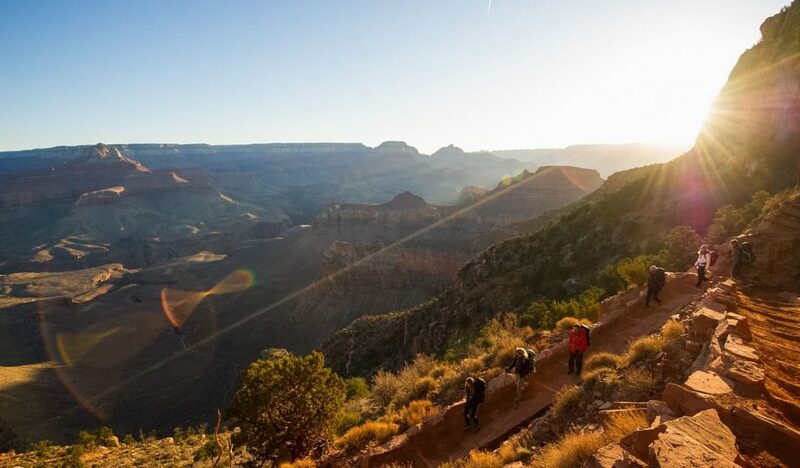 As you hike along, breathtaking vistas await you around each turn, and temple peaks and buttes rise out of the bottom of the Grand Canyon floor as the trail snakes downwards over three thousand feet and more than one billion years of geologic time. You’ll camp two nights at Indian Gardens campground and hike out on Day 3 back up the Bright Angel Trail return to the Grand Canyon South Rim. Our Bright Angel Grand Canyon Backpacking trip is the perfect way to become acquainted with the Grand Canyon National Park. Along this famous corridor trail, you will never be too far from beacons of civilization, yet carrying your own gear and relying only on your guide, your group, and yourself it becomes easy to quickly adopt the circadian rhythms of the surrounding wilderness. 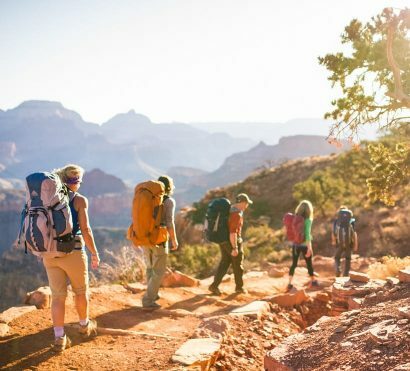 Your guides will pick you up from your hotel in Scottsdale at 6am and transport by van to Grand Canyon village on the South Rim and Bright Angel trailhead. Say goodbye to the Grand Canyon Resorts on the rim as we begin our hike along Bright Angel Trail which retains the closest contact to civilization that exists within the walls of the canyon, made apparent by water spigots at Mile-and-a-Half and Three Mile rest houses and the occasional fellow hiker. As we descend, the trail cuts through a fault in the imposing Redwall limestone, the highest continuous cliff band in the canyon and greatest barrier to inner canyon travel. Look for signs of wildlife as you hike along, but don’t forget to look out towards the towering temples and buttes rising from the bottom of the Grand Canyon. Battleship sits quite noticeably just to the west of our route and be alert to catch a glimpse of Sumner Butte, Brahma Temple, or Cheops Pyramid. Our camp for the next two nights is situated in the cool shade of giant Fremont Cottonwoods, near the perennial springs that for centuries watered the gardens of the Havasupai Indians. Soak your feet in the cool waters of Garden Creek and relax while your skilled guide prepares a delicious dinner for the group. The second day of our Grand Canyon backpacking trip is the perfect time to feed your inner curiosity about the diverse ecosystem within the canyon walls. 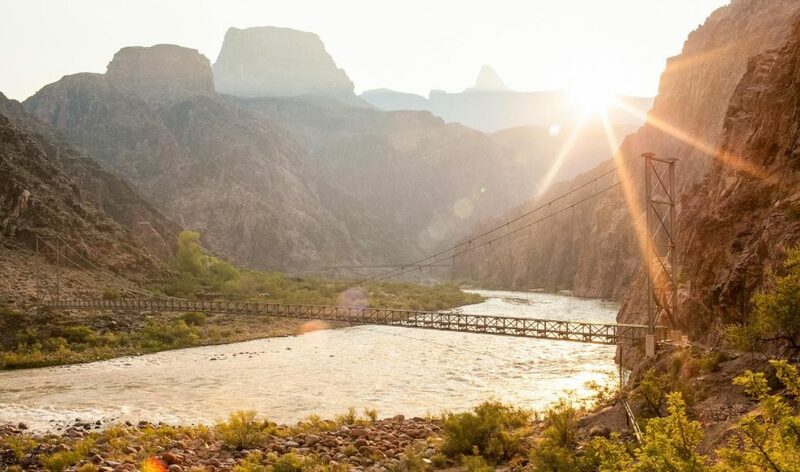 Options for the day include a shorter hike out the Plateau Point Trail to sweeping views of the Colorado River rushing along 1300 ft below or for more of a challenge some may prefer to push on down the Bright Angel trail to the Colorado River itself. The path follows along Garden Creek and descends into Pipe Creek Canyon by the tight switchbacks known as Devil’s Corkscrew. Look for a thin waterfall where Columbine Spring trickles down the west wall of Pipe Creek Canyon. At the mouth of Pipe Creek, there is a short trail down to the river itself where you may eve spot Grand Canyon rafting trips float by. Pause and rest in the shade at River rest house before returning to camp. Today is full of incredible opportunities to intimately experience the unique canyon landscape and wildlife. At the end of the day you will find yourself in a pleasant stupor of calm and relaxation, the perfect chance to hang out around camp and marvel at the brilliance of the Milky Way above. Taking advantage of the cool morning air, your guide will help you to break camp and get an early start on the hike out of the canyon. 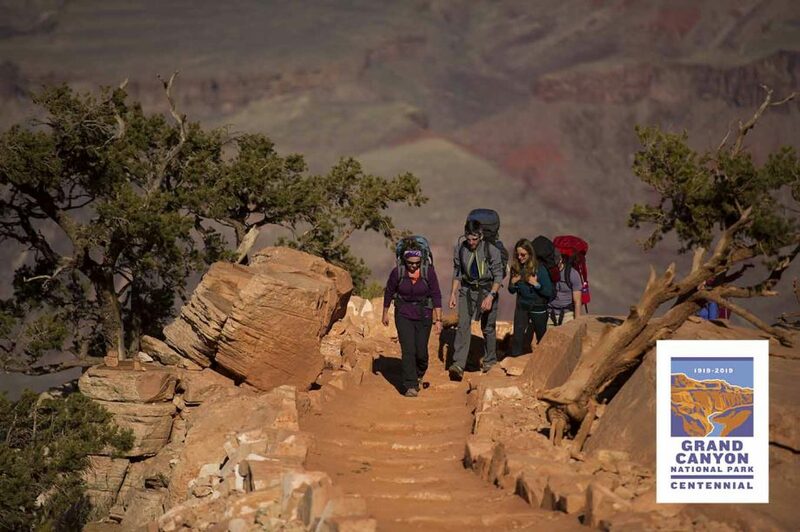 The return trek up the Bright Angel Trail takes a good deal longer than the descent. Gaining over three thousand feet of elevation, it affords an entirely different perspective from the views you experienced on the way into the canyon. 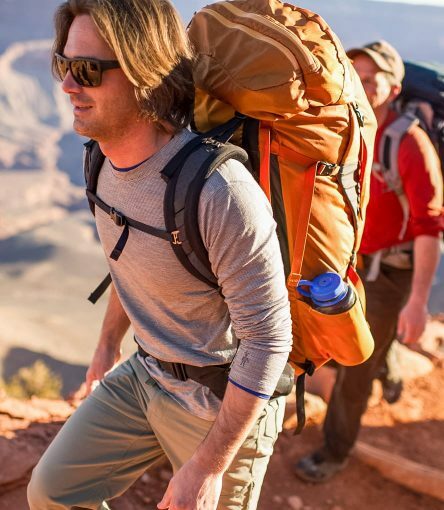 Your guide will give you plenty of opportunity to rest along the way with expert Grand Canyon facts and stories. 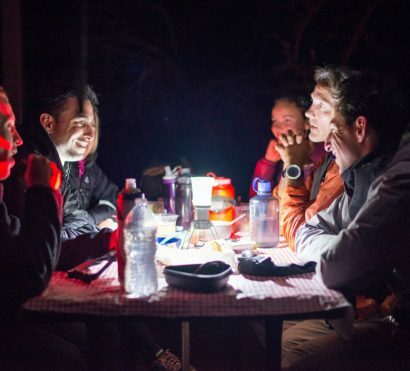 Your group will reach the South Rim by early afternoon where your lunch in Grand Canyon village will be well-deserved after the morning’s hard work. There will be some time to rest at the Rim and shop for souvenirs before boarding the van for the return to Phoenix. Arrival back in Scottsdale is typically by 6pm.